Reader question… “I’m dreading Christmas. With everything we buy costing more, financially we’re just barely getting by now and I know there isn’t going to be much money for buying gifts. Our kids aren’t the problem. The problem is my relatives. Some of them talk about Christmas gifts and shop for Christmas gifts all year round. They have gotten very upset the few times I have suggested that we all tone things down a little. They will not even consider a simpler, less commercialized Christmas. Is there any simplistic answer to this dilemma?” –Kyra L.
This question touches on a situation that is a raw nerve for many people. Although Christmas celebrations with relatives could… and should… be happy gatherings, the holidays often bring so much emotional baggage with them that they end up being more stressful than fun. Since Kyra’s family is resisting any hint of change, there may not be a solution that will make everyone happy. Some families are open to discussion and new ideas… and other families definitely are not. I’m asking for ideas here… How have you handled similar circumstances? What do you like best about your extended family holiday gatherings? And are you making any changes this year because of the current economy? Four years ago, we ‘bowed out’ of Christmas. 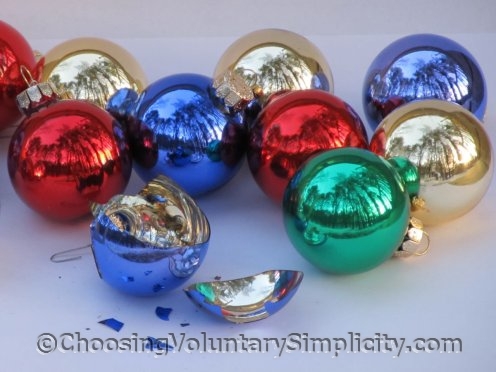 My family was hurt, and even though we carefully explained why we would no longer be celebrating Christmas, they were still confused and shocked. However, time has eased those feelings, and they now understand and don’t make any comments about it. That said, not celebrating Christmas really takes the pressure off of this time of year. We can drive around and enjoy the pretty lights on the houses at night, the good food (that’s always on sale this time of year)– all without the pressure and hassle of buying gifts, and meeting other people’s expectations. It is now a lovely time of year that we very much enjoy. AND, we don’t have to spend any money on gifts that might not be ‘quite right’. This really hits home to me too. We’ve been trying to scale back Christmas for a long time. I really could use some good ideas and suggestions from someone else’s experience. People get too caught up in the commercialism of Christmas. Last Decemeber we got rid of our cable tv service, best thing we did. We did this not due to finacial hardships (though the extra $$ has been nice!) but because of commercials. When we go round friends with TVs on 24/7 it amazes us the amount of commercials. You become more aware of the commercialism that surrounds us DAILY! Regarding gifts, well we did the ultimate and moved countries, lol! Not a solution for everyone I know but it sorted our problems out! if family want to spend christmas with us, they come to us! Seriously though, instead of getting wrapped up in your families existing ‘traditions’ branch out and create your own family traditions. Gifts, well this one is something I don’t have much experience with, as our family long decided that only kids count. Adults don’t get gifts unless they are direct family (brothers/sisters) otherwise you just buy the kids. When all said and done its gift time for children anyway. On a side note, I’ve been thinking a lot lately about these celebrations and why we celebrate them. I’m not religious in any way but I celebrate the secular nature of christmas. Afterall it’s hard not to as we get the days of work! But I am looking into WHAT I am celebrating a lot more. Why do we feel the need to crazy at these holidays? Christmas is a religious holiday for me… not for my extended family though. I might bake a special tin of treats for my siblings and their families… and for my children there are presents… small gifts for 1-2 close friends… but nothing much, it is the thought that counts. We enjoy open house at our Pastor’s home christmas eve… and during the season trekking around in a caravan to see lights…New Year’s Eve is an all night watch service at church, followed by a pot-luck and fireworks outside in the parking lot… that ends the season. After our first child was born, we told each of our parents that we were celebrating Christmas at home rather than spending it on the road. We promised my in-laws that we would celebrate Thanksgiving and Easter with them, which we did until both had passed away (which means for years and years). My mom didn’t care as long as we came to visit whenever possible, which meant a few visits during nice weather to my home town. Very enjoyable as there were no Holiday expectations. We only purchase gifts for our kids, son-in-law, and grandchildren. Even then we keep it as inexpensive as possible. I make cookies and candy for friends and other relatives. Since none of them do any baking themselves, they really enjoy it. We found long ago that we had to create our own traditions and decide what was best for the family. One thing that helped us was that we did not live in the same town when that decision was made and it stayed even when we moved back to my hometown. Christmas doesn’t need to be piles of presents under the tree. It doesn’t have to be, but we’ve all been brainwashed to think that’s the only way anyone will be happy and still love us . It’s ridiculous. We have a set amount of money we spend on everyone outside our house. We do tend to spend more than we technically should on our kids, but not on anyone else. This year may be different with the economy being the way it is. We made the decision a few years ago to scale back a bit, and this year it may be even more. People will just have to deal with it. I will not go further into debt to please others’ need for more “stuff”. Everyone will get something nice and thoughtful and meaningful. That’s really the way it should be anyway. I can’t really add much to the things said above. My extended family is very extended – we do not celebrate with any of them. Just my husband, my mom and my kids – and we buy for my in-laws as well, though we don’t see them, usually. I am divorced (and remarried) so my kids have always had to juggle Christmas with 2 sets of parents and 3 sets of grandparents. I decided 2 years ago that the hassle – which often included driving for 1/2 the day on Christmas day – was not worth it. My ex and his family celebrate Christmas for religious reasons. We do not. We moved our celebration to New Year’s Eve, and have never looked back. Just emphasizing that creating your own traditions can make life much easier and family time more signifigant. My mom loves to shop for Christmas, but I have slowly been convincing her that we don’t just need more “stuff” and she is starting to tone down her spending as well. I will still buy her figurines or whatever she is currently collecting, though, because that is what she likes. We’ve decided on one big gift for the entire family this year, something that everyone will get some use out of. I bought us a Wii! I got one used, so it fits with my frugal and ecological rules, and while it is expensive, I know we’ll all be playing with it six months down the road. And it makes it easy for us to figure out what to get each other; controllers or a new game. I haven’t travelled over the holiday in eight years, and that makes it my favorite time of the year. I do the tree and all the trimmings, but all the time I have makes it truly special. I can bake, make my own ornaments and cards, and create new traditions for my family. I think this economic downturn may be just what we need to get us back to normal!! Here’s my two cents worth. Decide what you and your spouse want to do and then just do it. Tell both of your families what it is and let the chips fall where they may. They will get over it or they won’t. You have to live in your skin, they don’t. Which for us means, we only spend a limited amount on Christmas for our children and we have an ‘open house’ Christmas Day. I fix a Mexican Buffet complete with a hand-made pinata. We laugh, visit and have a good time. Sometimes one of us will feel crafty and make something for everyone. One year I made a flour sack tea towel and pot holder for the women; for the men a remote control holder for their recliners. Everyone is please because no one is expecting anything. The first couple of years may be rough with hurt feelings but I would bet money you are not the only one who is tired of ‘Whoville’ Christmas scene. In our immediate family we haven’t given presents to each other for almost 15 years. The year before we stopped giving presents we found ourselves going from store to store looking for gifts for people who already had everything. Several of the extended family members used to talk about how shopping for Christmas presents had become not so much fun any more but when the wife and I decided this wasn’t the kind of Christmas we wanted we tried to talk to the extended family members about maybe doing something different and none of them would even consider alternatives. When we bowed out of this kind of gift giving there was a lot of hard feelings. We still give a gift to my elderly father because he insists on giving gifts to us. All the other relatives no longer give us gifts and we do not give them gifts but as I said there is a lot of bad feeling about Christmas as far as these people are concerned. We really enjoy our family Christmas now. The tree, the lights, the Christmas story, and the special food we prepare together is much more meaningful than the previous days of desperately searching for the right gift and for us there is no going back. For gifts, we give things that are sentimentally meaningful. One of our favorites is a calender we make with pictures from the previous year of our children for the grandparents. We like giving gifts of service to each other, promising to wash the car, clean a room, or a massage for the wife — things we can normally do but can be cashed in when someone really feels they need help. We also give traditional gifts, but we find substituting service and sentimental gifts for traditional gifts make Christmas more meaningful and sentimental. I, too, have been trying to convince everyone that it’s all right to have just a few gifts under the tree – we don’t need to fill the living room. I almost feel as if the economic downturn has helped me to remember what is important…what I need and don’t need. And it has convinced my family, finally, to see things my way :-) We are paring down to two gifts per person in our small immediate family. In the larger family, we do a “Secret Santa” draw. It’s a lot of fun, especially with the kids! A few years ago, my sister came up with idea of doing a grab bag for all of the adults. The limit is $25.00 and giving gift cards/certificates are not allowed. We each write a “wish list” of 3 items and the person who draws the name picks one of the items from the list. We pull names on Thanksgiving after dinner. We still buy presents for the kids but don’t go overboard. Even though my daughter is an adult and participates in the grab bag, I still buy for her because after all she is my daughter. I also buy for my husband. This year I am making my neices and nephews Christmas presents. When my grandparents died, I took some clothing items of theirs. I bought some unbleached muslin and I am going to make the kids pillows with appliqued hearts cut from the clothes. In order to save on costs and postage, the ones who live out of town will get only the squares, and their moms can assemble the pillows for them. It is the gathering together – the sharing in joy – Last year around Christmas, mom who is 82 gave the girls in the family a gift they will never forget – a memory! She asked all of us to dress up in old formals – mom dressed up too of course – we even dressed the 1 year old in a “formal” – I found a waist length slip and put elastic across the back cut the straps and tied it around her neck – very cute (Fifty cent day at the thrift store helped out with the formals.) We polished the nails, put lip gloss on the little girls and all of us put on all kinds of old gaudy jewelry. Then she had a few parlor games for us to play. We decorated the dining room table so beautiful it would make you cry – we even had real flowers left over from a wedding. Mom got out her good dishes and we filled them with finger goodies some good for you and some not… She had her good china cups and poured tea for everyone. We had some kid sized china for the little girls. The eyes still shine when they talk about that little tea party. For several years I have made calendars for family members. My husband takes beautiful photos, and sometimes I use pictures of the family, others just scenics, and one year I made a cookie calendar with a dozen different photos and recipes, one for each month. The calendar has every family member’s birthdays and anniversaries listed on the appropriate dates, and serves as a reminder should anyone be so inclined to send a card or greeting. The cost is not very much when you consider the value, especially if you have your own color printer, but I often found sales on color copies, and companies would give me a discount on large quantities. I have also always made certain people gifts, mostly because they have everything they need, but also because it is less expensive, and comes from my heart. I do love giving, and give a great deal of thought before spending my time or money on a gift. Recently, however, I have noted a lack of appreciation on anyone’s part, so this year, we are cutting way back and only giving to those in the family we see often. Christmas with our relatives was always stressful and almost always ended badly. A few years ago we decided to have just a simple and meaningful celebration at home and that has continued. Now we really enjoy the holidays. My advice, do what is right for you and your family. The run up to Christmas isn’t normally so bad on the commercials front in France: it is the custom that things don’t start really until early December. It’s noticably earlier this year: shops are desperate to sell stuff! We’re not expecting any family for Christmas this year – they are in England: they can’t afford the time and we can’t afford the boat fare LOL. So we can have our simple Christmas instead: midnight mass, a modest selection of gifts, some friends around for a four-hour marathon lunch with a little fine wine and then a nice family evening. Much more my sort of thing than the consummer fest. The year my daughter was engaged we had very little money to spend on a Christmas tree but I wanted to make one last special Christmas for her before she moved out. I sent the kids all out on a search for a soon to be bulldozed cedar tree from one of the many empty lots in the subdivision where we were living. While they were out I made cookies and hot chocolate. The kids brought home a fine specimen and we went through the ornaments we had made over the years and loaded them on the cedar tree with a set of 25 year old lights. No expensive tree ever looked better. During that night I smelled something awful in the house… Just couldn’t sleep – whew… So I got up and followed my nose. The stench seemed to be coming from the tree. I hurriedly pulled the ornaments and the lights off the tree and threw the tree out the house door. I put on all the vent fans and got out some Cinnamon sticks, etc and boiled it make the house smell good again. Whew it was powerful. Then I climbed back in bed and since I could breathe, I went to sleep. A couple hours later, my son and husband got up and they got real excited – there were does all over our yard. Must have been a dozen. When I got up they were still looking out the window at the does and trying to figure out what was going on… How did a tree get in our yard? Didn’t we have a Christmas tree in here last night? WHAT? It was the tree attracting the does – seems some buck had a special tree and our soaking it in water kind of activated the scent ‘Eau de doe’? We had does all over our yard as long as that tree was in it. Powerful stuff. When the future SIL came back over he noticed the tree was missing but we had replaced it with boxes draped with an old green fabric tablecloth (looked weird) and then decorated with the ornaments – he probably wondered what kind of nut case family he was getting into – first a cedar tree then odd shaped boxes? On Christmas, after we opened all the gifts future SIL thought we neglected to get him a gift. He looked so forgotten… Then we told him he could just keep the “tree” and he could “mark” that one himself. Since our future SIL was remodeling his house we had all chipped together for his Christmas gift (Someone we knew was selling a toilet for a really good price.) and that is what was in the weird shaped boxes we draped to replace the cedar tree. I found out later that sometimes you can get a good price on a tree if you wait until the rest on the lot are mostly sold out – just not much selection – not all cedar trees smell like that one – if you ask, some times a farmer friend will let you take a cedar tree – they aren’t all that desirable to have on the property so they bush hog them anyway. I get frustrated almost to the point of feeling ill when I go to the in-laws’ for Christmas. My husband and I each get a pile of cheap presents that we will either throw away or donate (his mother and step-father let each of their small children pick their own gifts for us, which end up being things like stinky bath sets for me and tools that we don’t need for him). We also get a PILE of presents for our toddler son, many of which we will also donate because I feel like he doesn’t need the noise and flashing lights and insanity to be a happy child (and we don’t want it, either). A mere mention of scaling back makes my MIL cry, but I hate to see such waste. Our income is right around $600 a month – needless to say things are kind of tight. I have discovered a Goodwill outlet store here in Indianapolis. They weight your purchase and you pay by the pound. This can be very expensive if your stuff is heavy. Then they have paperback books for 25 cents each and hard back books for 50 cents each. I was able to find books for everyone on my list. Then splurged, I found a bolt of purple filmy sheer fabric for about $2. My grand daughters will think they are in heaven when they drape that stuff around a few tables and chairs to make some tents. They will have to learn to cooperate, to share and to be creative. I found them a cool encyclopedia sized book of animals and another about birds – both huge with cool pictures and only 50 cents. Will they think I went cheap. NOPE – they are used to it. My husband and I had decided awhile back that Christmas gifts are for the kids. We might do one gift between the two of us, usually something we need, but we focus on the kids. Each of them gets 2 gifts from us, this year they are homemade, and then whatever they get from grandparents. When we get together with our folks we give them a food or bath basket that I made. The kids all get something small. We have tried to focus more on making our own presents and you would be surprised at what you can make for cheap. Example, this year my husband and I made and painted marshmallow shooters for my nephews. All in all 10 gifts for less than $20 bucks. We haven’t had issues with relatives not understanding why we don’t want to spend much but whenever we do get together in a large group we will do a name draw. That way we are not having to buy gifts for an enormous amount of people. I have a very small family: parents plus a sister and brother-in-law. My husband and I agreed years ago not to buy each other Christmas gifts, which has been great. With my family, I’ve always been the one asking to scale back, and I’m either ignored or accused or ruining the fun. I’ve suggested different versions over the years, such as one gift per person, or agreeing on a spending limit, but to no avail. There are no kids in our family, so we can’t do the gifts-for-kids-only approach. I like giving practical gifts, while my sister likes to give decorative items. My mom’s a QVC addict, so lots of odd items show up under the tree, depending when she tuned in. I think a lot of the items end up at Goodwill. P.S. We used to exchange small gifts with two of my husband’s good friends each holiday season. I was so relieved when one of them announced they couldn’t swing it this year and gave us ample notice so we wouldn’t worry about what to get them. We’ll still exchange cookies and there’s no pressure! It’s hard to be the person to “opt out” first. I don’t enjoy Christmas gift exchanges. While I am far from wealthy, I have everything I want. Other family members seem to have everything as well. I have tried for several years to encourage folks with whom we exchange gifts to make donations to charitable causes instead of buying an unnecessary gift that often lands at Goodwill by the end of the season. One year, I made a nice donation to an animal shelter in the name of a family member. I wrapped the thank-you card in a box so she would have something to open on Christmas. She was disappointed with the “gift”, even though there was absolutely nothing that she needed/wanted for Christmas. It’s hard to bow out. It is His birthday. Everything else for me on Christmas is not important. Some years have been lean, some have been better. Yes, I like to give gifts to my daughter and my grandchildren and my husband and I buy little things for each other. All the cooking and the wrapping and the decorating is done by Christmas Eve. We have a small tv for watching tapes or DVDs and we always watch The Grinch and A Charlie Brown Christmas. We make sure the birds have treats and we take a little ride to see the lights. I can’t think of any good advice but many before me have thought of great ideas.This year my husband and I just stopped giving each other gifts at my insistance.I suggested we get something like a rain barrel or log rack that we need instead of frivilous wants.I buy for my daughter and son-in-law-this I love to do also my neices/nephews 8 total,parents who are rich,bosses,and the list goes on and on.Each year I try and scale back each year in any way I can.This year I put my foot down at work my boss makes 500K a year, my parents are rich and they give a fruit basket to us which oddly enough I love.If I had my way well someday I will ease out of the maddness and if people were smart they would scale back before the debt and craziness overcomes us all. We like to say that “Your presence is our present” for extended family gatherings at Christmas. For us, it’s really about being together and enjoying each other and catching up while enjoying good food and fun. Several years ago, tired of receiving “stuff” that we didn’t need or want, we just quietly opted out of the family name drawing. We told them that it was fine if they continued to draw names; we would be happy to watch them open presents and not be at all offended that none of them were for us. On the other side of the family, my sister-in-law was very offended that we wanted to stop being in on the present swapping, even though everyone in the family except two (of the eight) siblings wanted to stop the present mania. Alas, we can’t please everyone. But guess what? People move on and get over it. If not, they’re the ones wasting money and energy while we are blissfully enjoying a more simple holiday. We do presents for our children, but they aren’t so extravagant that we are paying for them until May. Something we started doing recently was letting them shop as a group for each other. So, all of the siblings (except the one receiving the present) go shopping together with a $25 limit. Not outrageous. They can get several small things or one big thing–whatever they decide and whatever they can afford with their limit. *Tip: Don’t get caught up in trying to explain or justify your reasons. Say it once and be done. Don’t get sucked into arguments and defensiveness. Just make your choice and let it be. Try to start the conversations way before Christmas, to set expectations before the emotions of the season kick in, and to give them time to process the idea of toning it down. It’s a big change for some, and already isn’t getting a warm reception at first. We started by revamping our gifts to others first – we buy baskets at the local Goodwill and each family member contributes something homemade to the basket – and that is what we give to others. Then hubby and I started weaning family members from buying us gifts. If they insisted on buying gifts for the kids, fine. If they really wanted to get us something, please donate to a charity, write it on a card and let us unwrap that on Christmas. Pretty sure they all thought we were crazy until 2 yrs ago when my mom asked us all not to buy gifts but to donate our time in a creative way and then share that with her at Christmas. We still have family members that think we’re nuts and go crazy at Christmas, but we don’t let them define how we celebrate. We try to be as gracious as possible, donate what we don’t need, and try again next year. Maybe one day they’ll realize that slowing down the season actually helps them enjoy it too. In the past years we have scaled back as a family, its been a little tough for the “shoppers” in my family but they have gotten used to it! At first we decided to do a Secret Santa for the adults, drawing a name out of a hat, where each person had written their name and 3 ideas for presents under a certain amount, the children get their presents as usual (however I have been known to buy a better “shared gift” for siblings- as I do for my two boys!). This year we lowered the price of the Secret Santa by half and are doing a “grab bag” type present without the list, we’ll make a game out of it. I think even the “shoppers” have appreciated the scaled back costs and less stressful Holidays! We are what you call Born Again Christians (Baptist), and to us Christmas is more about our faith beliefs and our family. We get a few presents for each other and we get our 2 children somethings and they get us a couple of things nothing real pricey and that’s it. I love it – no more going into hock and worrying over bills etc. I get stuff all year round when I need it. I don’t wait for Christmas to get a tool I need in July. It makes Christmas a lot more fun! The biggest thing I worry About is the extra pounds I have to take off after eating all them Christmas cookies. Our extended family knows our beliefs and they have accepted it. They got tired of going into debt too and are now trying our type of Christmas. In our home, Christmas is the Nativity of Our Lord. We observe Advent with Advent candles and don’t decorate until Christmas Eve, then relish the joy throughout the true Christmas season, until the Epiphany of the Lord. Bending ourselves and our home life to the liturgical calendar as opposed to the secular and commercial calendar has been very freeing. It stung at first, but now the season is full in a way that all the “gifts” – really, obligations – never ever approached. Our families are reasonable about exchanging gifts. Our family has decided to do a white elephant gift exchange because there are just too many in our family for everyone to buy something for everyone. Now we simply buy just a few gifts and we have a fun time together doing the white elephant exchange. It has scaled back on the “Wheres mine!” from the kids and the out of pocket expense but has increased in fun and enjoyable family time. To the original poster: Try to do what I did. At the last Christmas we all bought expensive gifts, I announced that we were having to scale back financially and there would be no gifts from any of us for more than $10 next year. One gift per person from our family. I told them they were welcome to do as they wish, but I asked them to please do the same. The first year, I bought gloves at WalMart for all of the kids, and decorated them with yarn embroidery. The adults got baked goods with the recipe enclosed. The next year, the kids got yarn embroidery hand-decorated socks (the ones with the sticky things on the bottom), also from WalMart. Last year I made scented soap for everyone. It was fun to make! (The guys were amazed that their soap actually had a masculine smell. lol) This year I haunted all of the thrift shops all year long and the kids all got blankets/throws, some actually handmade, to which I added handmade embellishments. Every time we get together the kids want to know what I am doing this year and the adults comment on how much they enjoy the home made goodies – my homemade pumpkin bread was the biggest hit. Next year I am thinking about making winter wreaths for each household for the adults – not Christmas, cause they only work a few weeks, but winter themed that can be used all winter — the evergreens in my back yard are beginning to cringe as I walk by. The few who do not like what we are doing will either get over it, or not – everyone else is having fun trying to find good gifts for under $10, and no one is suffering financial hardship. From the beginning, we rarely went overboard at Christmas, which did put some noses out of joint. I let my children select gifts (because that’s how they learn) with a $10 limit but helped them make sure it was a gift the person receiving it would enjoy. But, as the years passed, our skills let us make more of our gifts, either edible or crafting, and that’s what we did. I refused to let the commercialism of Christmas overwhelm the point of a small remembrance to someone special. What I always found outrageous was when parents would buy very expensive items for their children to give adults! If the kid wasn’t earning the money, was anybody fooled? I’m a firm believer in NOT giving gifts to people who say they don’t believe in giving gifts at Christmas. If you don’t believe in giving gifts, then don’t accept gifts. Saying you don’t want to hurt the giver’s feelings is no excuse. There’s a happy medium and that means not breaking your bank just to fulfill someone else’s idea of what THEY think they deserve. Bottom line, everyone should decided what and how they want to handle gift-giving at Christmas and follow that ideal. My late grandma was always the intense driving force behind celebrating Christmas. It was always a big deal when she came to town and she and my dad spent the holiday butting heads about nearly everything. Since she died, things have been a lot more chill. My husband and I fly out to see my parents (cross-country) but it’s just a vacation really. There’s no pressure to celebrate Christmas any more than we’re inclined. We go to some parties, exchange a few little gifts, and generally just hang out and enjoy each other’s company. My dad is easy to shop for–I usually run across a book sometime during the year that’s perfect for him and his many interests. My mom usually gets me something like a DVD, and I usually don’t get her anything in return because she’s very hard to shop for. She understands and doesn’t mind. We all have the means to buy small things like these that we want, so we don’t try too hard to guess what other people want by buying Christmas presents for them. Everyone needs to stop worrying about making everyone in a family “happy”. Our family has attacked our addiction to materialism directly and Christmas was affected but also very much celebrated. With music, decorating and food we don’t usually eat (we call it special time food). If that makes someone unhappy, we really have no control over that at all. Some members of our family have tried to give us money as we are making our own laundry soap and have gotten rid of a lot of our things. This made us laugh because we are not poor and suffering just trying to change our lifestyle to work in concert with our natural environment. Happy holiday season everyone. And this website is so wonderful. Thank you to the publisher of same for creating it! I talked my family into a “make it/bake it/grow it/sew it” Christmas. Tho’ no cheaper, it was MOST memorable…but tougher to fulfill, so the unintended consequence was that we’ve since stopped swapping gifts among the adults. gotta love that!! We set a monetary ammount that is comfortable for us, not what we think our family expects us to spend. Then I make each person a gift. This year I made scarves from my stash yarn, years past I have made jewlery, spice blends, preserves, sauces…. Since we decided this route, I have actually come in under budgets two years in a row and feeling even more merrier having made some of the gifts. There are so many comments here that echo my own feelings. My husband and I have been married for 35 years, known each other for 36 years. Out of those years, only 4 haven’t been spent with my family. Only two of them were spent with my husband’s family. And yet, my family is upset that we’re planning our own quiet celebration (just the two of us)in our own home. I like that we keep it really simple. Gifts are de-emphasised and we focus on just reconnecting and being together. Just now seeing this post, which is right on target for what we are thinking about doing with Christmas. I have 10 brothers and sisters, and half of them have children. Although I have been away from my childhood home for over 5 years now, I always bought everyone gifts. The family just grew to much to afford it. We use to trade names, then people complained about that. 2 years ago, My husband and my pregnant self flew in to see family and handed out jars of homemade cranberry relish. We didn’t get the kids anything. People complained. Last year, I purchased books on amazon.com for all the nieces and nephews. I even had them gift wrapped, then delivered to the address where I knew my family would be gathering for the Christmas Eve gathering. Not one thank you, but did find out that some of the books that I bought for my youngest nieces had not even been opened. This year, I am thinking that I will do one of two things. 1) Draw a name of one of my siblings out of a hat and then shop for just their immediate family or 2) shop for no one because we would have just had our second child. Bottom line is with a large family, it is IMPOSSIBLE to please everyone. I have spent lots of money on christmas and birthday presents for distant relatives, but once I had my son, he wasn’t getting that same gift giving in return. So to keep me from being bitter and braking OUR bank account, I am drawing a line. If family can’t understand that, then shame on them. I wish also that I had read this before talking with the loving, generous family member who loves to shop. I asked for simplifying Christmas to just one gift. In the end, she was cordial and thought that keeping the limit to under $20 was fine… But before we got to that we ended up talking about all my reasons for downscaling. I am afraid this made her feel judged, as though my ideals for simplifying are better than her ideals for generosity. Because we don’t want to judge another person’s motivations (especially for gift giving! ), the advice to skip the reasons is very good. Skip the reasons that you have for scaling back (consumerism, materialism, excess, the real reason for Jesus’s birth…) I think that this is not truly a need to be “understood”. many times it feels lonely in a family not to be understood, so we try to explain ourselves. I am afraid it ends up making us (me) appear ‘better than thou’, which is not in keeping with Jesus. My husbands family picks names one for children and one for adults and put an amount for everyone to spend and ask them to stick to the price range very nicely of course we have a blast doing we try to keep it secret from each other it’s less shopping, money and stress. To cope with some people having more money to spend than others and the rampant commercialization we started a new tradition: A gift game. Everyone was asked to brink $50 worth of gifts per person (since this was the ONLY gifts we exchanged, we had a high dollar value – you could easily lower this amount and have fun). the $50 could be spend on one gift or many. Gifts were brought wrapped and stacked up in a pile in the middle of the living room. To start, an administrator set a timer then started the game by rolling two dice. If you got a pair you were allowed to grab a gift from the pile (but do not unwrap it!). After all the gifts were selected, the fun starts. You want to make sure the timer is set so that there’s enough time for everyone to pick up all the gifts, PLUS another 10 mins or so to steal- because once all the gifts are gone we’d steal from each other. This is where pretty wrapping paper or a large package all of a sudden becomes the target of mass stealing. We did not have a limit for stealing and often battles over one or two coveted gifts would break out. Once the time goes off everyone stops and starts opening up the gifts they have collected. Now, this is where competitiveness turns into Christmas spirit. Once all the gifts are open, you are free to give, exchange or do whatever you like with the gifts you won as part of the prize. Some favorites have been nice quality scarfs, gift cards, movie tickets, lotions, etc. Gag gifts have also had their place. In the end, we all spent less money and had fun. When my aunt and mother were still alive, I sent beautiful live flowers ordered online for Christmas, Mother’s Day, birthdays and Easter. Both had enough stuff, and appreciated fresh flowers. The last Christmas my mother was alive, I send a charity donation of live animals to poor villages in her name. She died 4 days before Christmas – yet that little legacy gift kept on giving in her name for many years… I am sure. I hope the good vibes of that gift are following her wherever. I stopped giving to nieces and nephews when my 7 year old nephew confided that nothing I ever sent fitted or was wanted. Truth outs! Stop the charade! I enjoy quiet Christmases – watching televised Christmas eve services from around the world, meditating peacefully, taking a quiet country walk. The week or so before Christmas, I meet with special friends and we enjoy special treats we make for each other and a few calm hours getting to know each other a little better. Occasionally, we give a little momento level gift we pick up at a yard sale to each other. It’s a relief to know no one busted a budget for a “should” give. I used to go the live Christmas eve services, but the number of highly intoxicated people in the pews made if feel unsavory to attend. I also makeup very nice e-cards to send to special friends and family at Christmas. 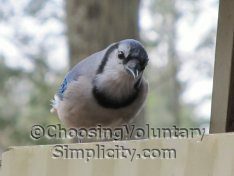 I pick photos they would like and use a program to write a personal greeting on the photo – then email it to them. I know they’ll get it even if travelling during the holiday time. I enjoy a sane, quiet, peaceful Christmas. When I hear the drama-trauma stories of those who get together for holidays, I appreciate even more having chosen a quiet peaceful Christmas interlude – savoring the sweetness of the energy and the Christmas spirit. My husband and I both come from big families. His family was already doing a gift rotation when we got married (each year you give to a different sibling and their family), so that hasn’t been too stressful. Often it is just a family gift. My family was still having everyone shop for everyone. It took a couple years of me bringing it up (and the family growing even more), but eventually everyone agreed and now we do the rotation as well. That has helped. I agree with others that you shouldn’t try to live up to other peoples’ expectations of what gifting should be. You could bake, or make ornaments with the kids to give out, or anything simple/thoughtful/inexpensive. If other people choose to give more “stuff” that costs more money, that is their choice. Figure out a dollar amount for a gift ( And, stick to it !) Everyone has to agree! Let’s just say…$30.00 or $50.00. Then put the name of each person participating in a bowl or hat, and each person draws who they will be buying for. That is it…One gift or gift basket with random items that equal the dollar amount all agreed to. We do “baskets” and fill them based upon a particular person, family or theme. THIS YEAR IT IS A FAMILY BASKET. We each picked a family out of the hat and were responsible for putting items that family needed, waged or would enjoy in that BASKET. Wrapping g each item separately making it more fun! Also opening each BASKET one at a time makes it last longer and everyone gets to share in the excitement of each one ! —-This works for us! A Whoville Christmas doesn’t happen at my house, I live on a very tight budget. I love Christmas, I love giving, but my children came first and even they were limited to what I could/would spend. So when I give to others it’s homemade: a jar of jam or pickles, maybe crocheted potholders, embroidered tea towel, a few tea bags of a fancy tea or a pot or twos worth of an exotic coffee. Nothing much, I was thinking of you, a token of my affection for you. Since I have always operated this way, if others have had hurt feelings I guess they have gotten over it.